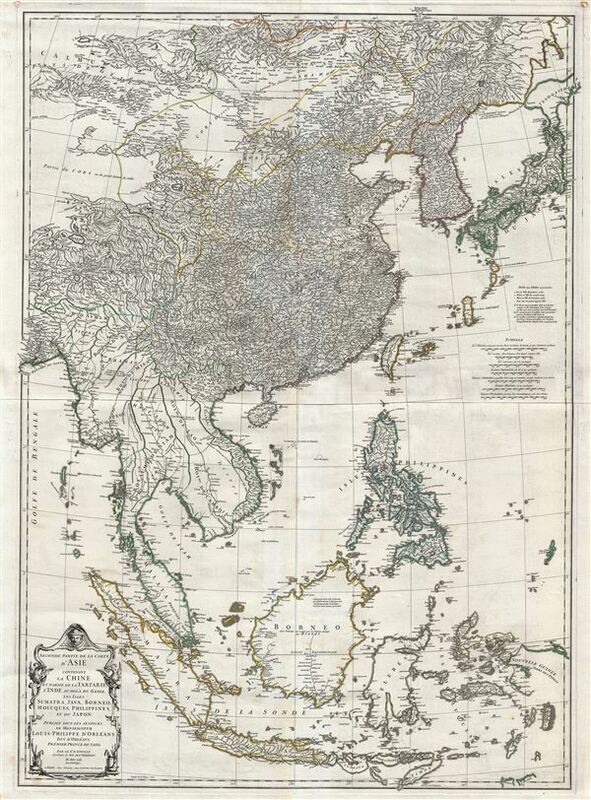 A scarce large format map of East Asia. Second partie de la Carte d'Asie contenant La Chine et Partie de la Tartarie, L'Inde au de la du Gange, les Isles Sumatra, Java, Borneo, Moluques, Philippines, et du Japon. A remarkable and near pristine example of French cartographer Jean Baptiste Bourguignon d'Anville's 1752 map of the East Indies, China Korea and Japan. This impressive map covers from the latitudes of Mongolia and Hokkaido south as far as Timor and Java, including all of China, Japan, Taiwan (Formosa), Korea, the Philippines, Vietnam (Tonquin and Chochine), Laos, Cambodia, Thailand (Siam), Pegu (Burma, Myanmar), Tibet, Malay, Singapore, Sumatra, and Borneo, as well as most of modern day Indonesia. This map is deceptively sophisticated and dense, so much so that one is immediately inclined to praise its depth without considering its cartographic shortcomings. On the whole, D'Anville presents a highly impressive map of a region then only tenuously understood by European geographers. Korea is notably square at the base. Hokkaido, or Yesso, is attached to the Japanese mainland as well as grossly malformed. Okinawa is so massively oversized that it nearly eclipses Taiwan - a clear indication that D'Anville is drawing from Japanese manuscript sources that typically mapped the island as such. The map's density rapidly diminishes as once moves south out of China into the lesser known kingdoms of Southeast Asia and the East India Islands. While the major river systems are mapped with some accuracy, particularly in Pegu (Burma), Siam (Thailand), Laos, and Cambodia, the remainder of the region is vague at best. The interiors, with the exception of Java and the Philippines, both of which had been aggressively mapped by the Dutch and Spanish, respectively, are generally empty and vague. The Straits of Singapore (Sin Capura) are noted and the island of Singapore is present, if unlabeled. D'Anville prepared this map in 1752. Like most D'Anville maps it was an independent issue and included in various made-to-order atlases on a case-by-case basis. It was engraved for D'Anville by Guillaume Delahaye. Very good. Two sheets joined. Original platemark visible.